While the first blog in this series explained how Indian government mandates have determined the current character of the digital financial services (DFS) market in India, this blog is more forward looking, focusing on addressing issues of agent training and support. The 2015 Agent Network Accelerator (ANA) Survey data shows that these are areas where providers are struggling, and are therefore also opportunities for creating competitive advantages as new players enter the market. The government has recently licensed payment banks, which will hopefully bring more aggressive competition to the DFS space in India, driving usage for customers and profitability for agents. However, payment banks must ensure they build their offerings on a solid foundation, and that means focusing on the bricks and mortar of the agent network from the beginning. This blog provides advice for where these payment banks and existing providers should focus, so they can ensure a solid foundation for scaling their roll-out in the future. The Helix Institute, in partnership with the Harvard Business School, conducted econometric analysis, and found that agents who are more knowledgeable about mobile money policies experience a significantly higher transaction demand than their less-knowledgeable peers. Knowledgeable agents are a product of careful selection, followed-up by high quality, targeted and repetitive training. The study also found that these well-informed agents experience an even greater increase in demand when there are competing agents nearby. 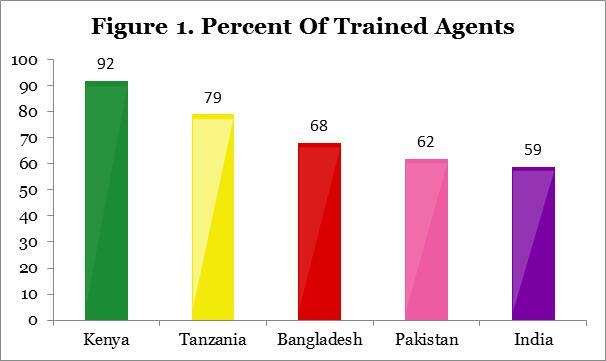 The findings suggest that expertise is a dimension upon which mobile money agents compete, and indicate that service quality is critical to a healthy agency. Regardless of how good the training is, issues will still arise in the field, and providers need to support agents through regular visits and call centres. Support visits are important to ensure agents are well-informed, can provide a high quality of service, and help build agent loyalty to the brand. Support visits can also be used to collect important business intelligence from the field. 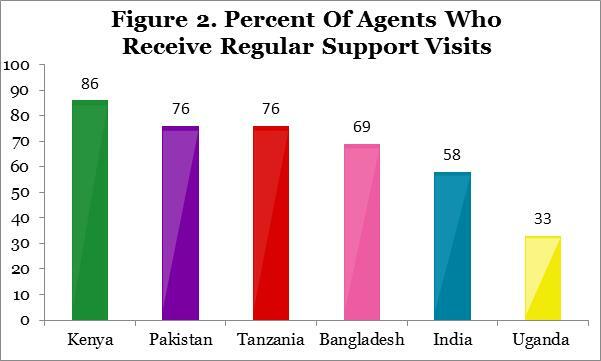 However, only slightly more than half of Indian agents (58 percent) reported receiving regular support visits – again lower than other ANA countries like Kenya (86 percent) and Bangladesh (69 percent), as demonstrated in Figure 2. This means that providers are blind to many aspects of how their agents appear and operate, as well as what competitors are doing in the area. Extending regular visits to a higher proportion of agents will give providers higher quality of service, happier agents, and the ability to adapt strategy faster than their competition. Support can also come in the form of immediate assistance via a call centre. At present, the evidence indicates low awareness and usage of this facility—only 59 percent of agents are aware that there is a call center, and those that do know, only call it a median of two times a month. Again, these metrics are significantly lower than other countries. Agents further report that “dealing with customer service when something goes wrong” is the biggest challenge they face as an agent. The first step will be to increase agent awareness of this support option, and the second will be to encourage them to call in by giving them immediate answers to the problems they face. This is also an opportunity for collecting business intelligence, which will help improve the service offering, given that the system developed is sophisticated enough to detect trends in the issues agents are having. On the customer side, data from the Indian Government (PMJDY) and Intermedia (2014) shows that up to half of the bank accounts opened by Indian agents are not active, meaning that the extension of access that the government drove has still not translated into efficient usage of these systems. Further, data from InterMedia (2014) also show only 0.03 percent of adults are using a mobile wallet, and only 13 percent are aware of mobile money. This is consistent with the agent perspective, as they rank the lack of customer awareness around DFS products as the number one barrier to conducting more transactions. A little over half of agents (52 percent) also don’t think their providers’ marketing has helped generate awareness of DFS products among consumers. Research conducted by MicroSave indicated that marketing support from providers was often limited and only amounted to giving agents some marketing collateral. Above the line and below the line marketing is expensive, but unless providers invest in it, customers will not use the systems and agents will be left without the business they need to drive profits for their business. Scaling agent networks must be sequenced to carefully balance new customers with new agents, so a sustainable ratio between the two is kept, as explained in this Helix Institute video. Agents are the bricks and mortar of a DFS business. With payment banks designing their strategies for building their agent networks, they must also ensure they get the operations right, putting high-quality agents in the market, supporting them effectively, and playing their part in seeding the demand they need to earn a decent revenue. This post was originally published on The Helix Institute’s blog and is republished with permission. Photo credit: Institute for Money, Technology and Financial Inclusion / Flickr. Maha Khan is the Senior Research Manager of the Agent Network Accelerator (ANA) Programme at the Helix Institute of Digital Finance.